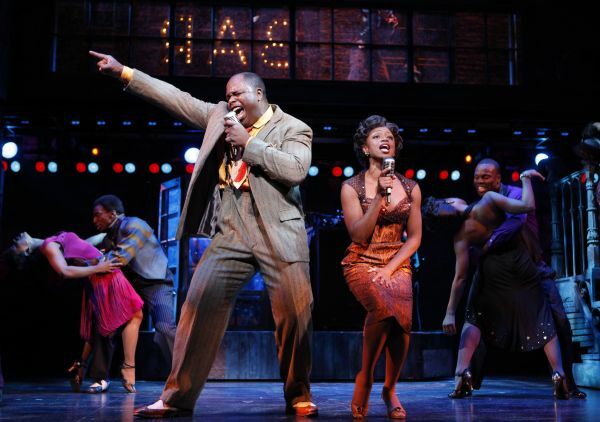 The hit musical "Memphis" is one of many shows lined up for Broadway in Chicago's 2011-2012 season. Pictured above is the original Broadway cast. Broadway in Chicago has some exciting shows lined up for the remainder of 2011 and beginning of 2012, including a solid mix of plays, musicals, dramas, and comedies. What am I most looking forward to? Well, Love, Loss and What I Wore has been quite the hit in NYC, probably due to an ever-rotating celebrity cast, so I’m eager to see what all the fuss is about. Saturday Night Live alum Nora Dunn is set to head the Chicago cast as it kicks off its North American tour. I’m also jazzed to see the one and only Princess Leia in the flesh as she shares her hilarious and harrowing path to sobriety and sanity in Wishful Drinking. I read Fisher’s book which the stage show is based off of, so I’m sure the stage show will be just as entertaining and eye-opening. There are also several repeat offenders (for lack of a better term) with Mary Poppins, Rock of Ages and Fiddler on the Roof making fairly recent returns to Chicago. I liked all these tours when I saw them in previous seasons, but it’s surprising there are so many! And The Addams Family, which enjoyed a pre-Broadway engagement in 2009, is making a Chicago comeback with a stop of the show’s first national tour. However, while tour stars Douglas Sills (Gomez) and Sara Gettelfinger (Morticia) are not household names like original Addams stars Nathan Lane and Bebe Neuwirth are, they are each hugely-talented performers, and the show, which I enjoyed in its pre-Broadway form, might find its balance without top heavy leads. Read this comprehensive list of upcoming shows, courtesy of Broadway in Chicago, following the jump. Keep in mind: shows, dates and venues are subject to change. After being extended twice on Broadway, COLIN QUINN: LONG STORY SHORT aired as an HBO Special in April 2011. Prior to Chicago, this critically-acclaimed, Drama Desk Award nominated hit will play East Hampton, Philadelphia and Montreal this summer. Comically channeling the demise of great world empires, Colin Quinn uses his “articulate brand of comedy” in taking audiences through an uproarious history of the world in 75 minutes. From his personification of Caesar as the original Italian mobster to his complaints about Ancient Greece and Antigone giving way to Costco and Snooki, Quinn is at his satirical best, taking on the attitudes, appetites and bad habits that toppled the world’s most powerful nations. COLIN QUINN: LONG STORY SHORT proves that throughout human history, the joke has always been on us. LOVE, LOSS, AND WHAT I WORE, with its starry rotating cast and wildly entertaining subject matter, is the toast of New York, and the “Best Of The Year!”–Time Out New York. Like the popular book, LOVE, LOSS, AND WHAT I WORE uses clothing and accessories and the memories they trigger to tell funny and often poignant stories that women of all ages can relate to. “Goes directly to the heart, soul, and vanity of every woman, young and old.” – Liz Smith, Variety. ANN: AN AFFECTIONATE PORTRAIT OF ANN RICHARDS is a play with Emmy Award-winning stage and screen actress Holland Taylor, from TVs “Two and A Half Men.” This hilarious and touching evening of theatre joyously celebrates a dynamic, inspiring woman and beloved daughter of Texas. From the fiery politician to the compassionate loving mother, Holland Taylor weaves a magical touch of the past and present in this no-holds barred story of Ann Richards that will leave audiences with an enhanced sense not only of a person and a time, but of themselves. Hold onto your hat! TURN UP THAT DIAL… From the underground dance clubs of 1950s Memphis, Tennessee, comes a hot new Broadway musical that bursts off the stage with explosive dancing, irresistible songs and a thrilling tale of fame and forbidden love. Inspired by actual events, MEMPHIS is about a white radio DJ who wants to change the world and a black club singer who is ready for her big break. Come along on their incredible journey to the ends of the airwaves— filled with laughter, soaring emotion and roof-raising rock ’n’ roll. Winner of four 2010 Tony® Awards including Best Musical. Get ready to experience Broadway’s most exciting new destination… MEMPHIS! FIDDLER ON THE ROOF is the Tony Award®-winning musical that has captured the hearts of people all over the world with its universal appeal. Based on the stories of Sholom Aleichem, FIDDLER ON THE ROOF has been lauded by critics again and again, and won the hearts of people all around the world. Filled with a rousing, heartwarming score, which includes “Tradition,” “Matchmaker, Matchmaker,” “If I Were A Rich Man” and “Sunrise, Sunset,” FIDDLER ON THE ROOF is a timeless classic. No other musical has so magically woven music, dance, poignancy and laughter into such an electrifying and unforgettable experience. Relive a glorious tradition of the musical theatre with FIDDLER ON THE ROOF. Spend the holidays with America’s favorite brother and sister team! DONNY & MARIE – CHRISTMAS IN CHICAGO, a holiday production starring America’s favorite sibling entertainers, will play a limited engagement at the Oriental Theatre. DONNY & MARIE are coming to Chicago fresh off their Broadway debut together with the critically-acclaimed successful and twice-extended run at the Marquis Theatre in New York. In the holiday tradition of the “Osmond Family Christmas” television specials, DONNY & MARIE invite you and your family to join them to celebrate the joy of the season in true Osmond fashion, in person, as the pair share a Chicago stage for the first time. With a dash of Christmas spirit and their trademark show-stopping production numbers, DONNY & MARIE – CHRISTMAS IN CHICAGO features your favorite hits mixed with the irresistible chemistry that made them international stars. Lurching back into Chicago for a return engagement, THE ADDAMS FAMILY is a smash-hit musical comedy that brings the darkly delirious world of Gomez, Morticia, Uncle Fester, Grandma, Wednesday, Pugsley and, of course, Lurch to spooky and spectacular life. This magnificently macabre new musical comedy is created by Jersey Boys authors Marshall Brickman & Rick Elice, Drama Desk-winning composer/lyricist Andrew Lippa (The Wild Party), choreographer Sergio Trujillo (Jersey Boys) and Olivier Award-winning director/designers Phelim McDermott & Julian Crouch (Shockheaded Peter) with creative consultation by four-time Tony Award® winner Jerry Zaks. Come meet the family. We’ll leave the lights off for you. Three-time Tony Award®-winner including the award for BEST MUSICAL REVIVAL, LA CAGE AUX FOLLES is coming to the Bank of America Theatre. This hilarious new production of LA CAGE AUX FOLLES was the biggest hit of the 2010 Broadway season, leaving audiences in stitches night after night! LA CAGE AUX FOLLES tells the story of Georges, the owner of a glitzy nightclub in lovely Saint-Tropez, and his partner Albin, who moonlights as the glamorous chanteuse Zaza. When Georges’ son brings his fiancée’s conservative parents home to meet the flashy pair, the bonds of family are put to the test as the feather boas fly! LA CAGE AUX FOLLES is a tuneful and touching tale of one family’s struggle to stay together, stay fabulous and above all else, stay true to themselves. Group tickets are currently available for all of the 2011 Season Series shows. Groups of 15 or more may receive a discount on most shows by calling (312) 977-1710. 2011 Season Series subscription packages will go on-sale to new subscribers on Friday, April 1, 2011. Broadway In Chicago gift certificates, which can be redeemed for any production or for season ticket packages, can be obtained at Broadway In Chicago box offices, www.BroadwayInChicago.com or by calling Ticketmaster at (800) 775-2000. Shows, dates and venues subject to change. For additional information on Broadway In Chicago shows, please visit www.BroadwayInChicago.com. This entry was posted in Arts/Culture/Entertainment, Theater and tagged Addams Family, Broadway in Chicago, chicago, Fiddler on the Roof, Mary Poppins, Memphis, Musicals, Plays, theatre. Bookmark the permalink.